My best fall outing in 2016 came on October 20. The season had been a let down for the most part due to the extremely warm and dry conditions most of the summer and fall. I had an aggressive plan this year primarily based on the dates of some of my favorite photos from years past. This…..was a strategical error on my part. October 1 came with primarily green dominated landscapes. Finally on the second half of October, color began to really pour in. 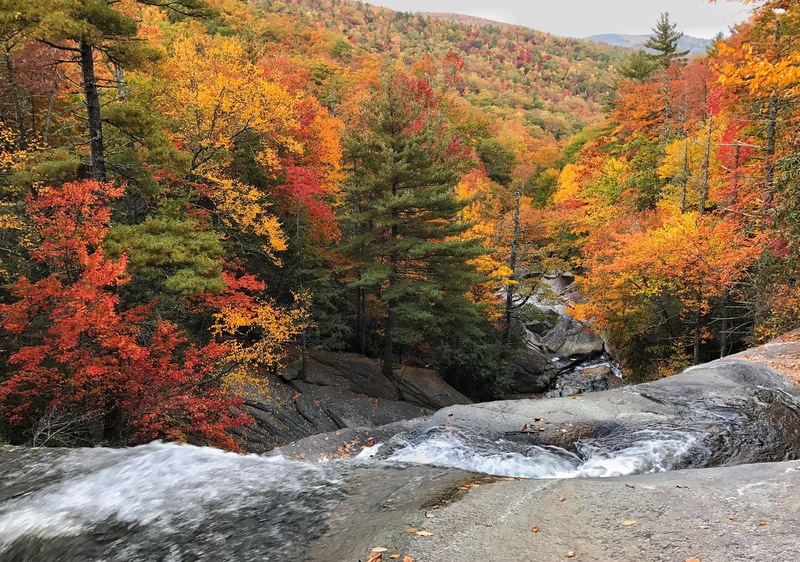 On Thursday 10/20, weather was an issue as it was to be the last day of temps in the 70s before the first real cool blast came in, dropping temps into the 40’s in the mountains for that Friday and Saturday. 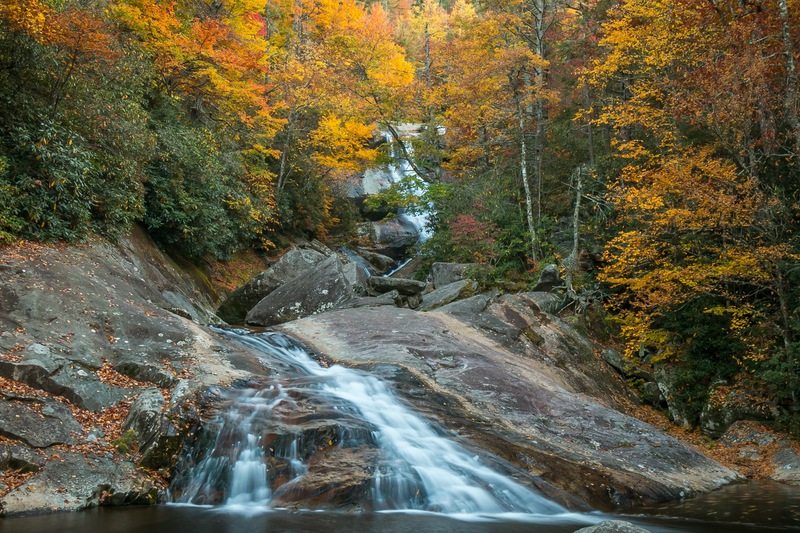 I chose Upper Creek Falls, because, well most others didn’t. 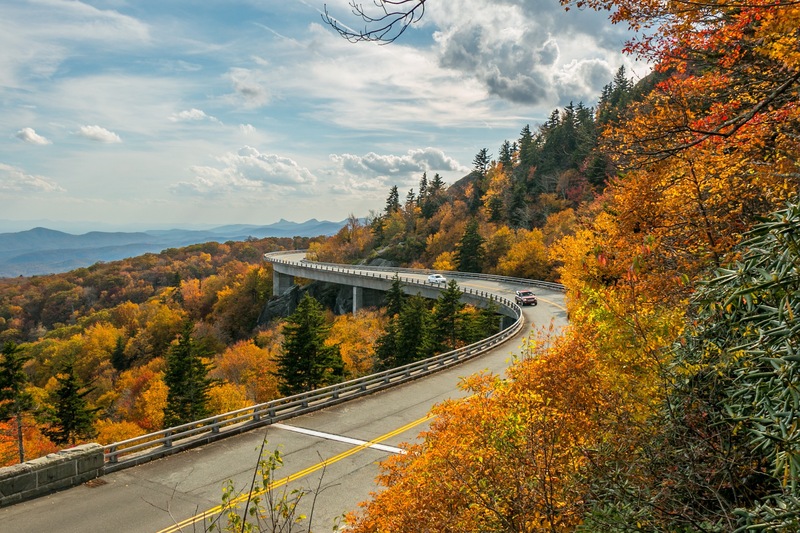 I would also need to ride along the Blue Ridge Parkway, through the Linn Cove Viaduct to get there. 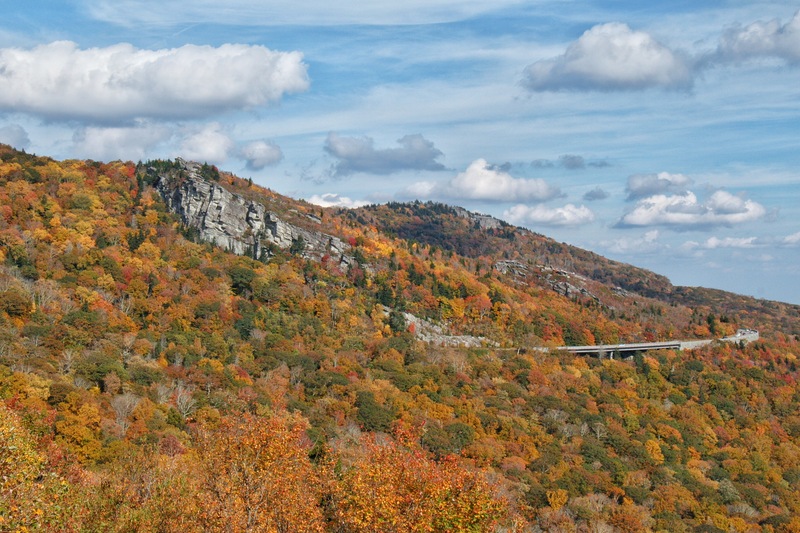 After 2 failed attempts t see color in the Grandfather area of the Blue Ridge Parkway, maybe this day would be better. And it was!!! I was here near the peak of the 2016 Autumn color season. My shot of the Linn Cove Viaduct was much nicer than the ones 1 and 2 weeks prior. After enjoying a few more miles of the Grandfather Mountain scenery, I came to the intersection with NC 181 and NC183 in the Jonas Ridge area. Take NC 181 south from here to reach Upper Creek Falls. It will be on the left a few miles down. 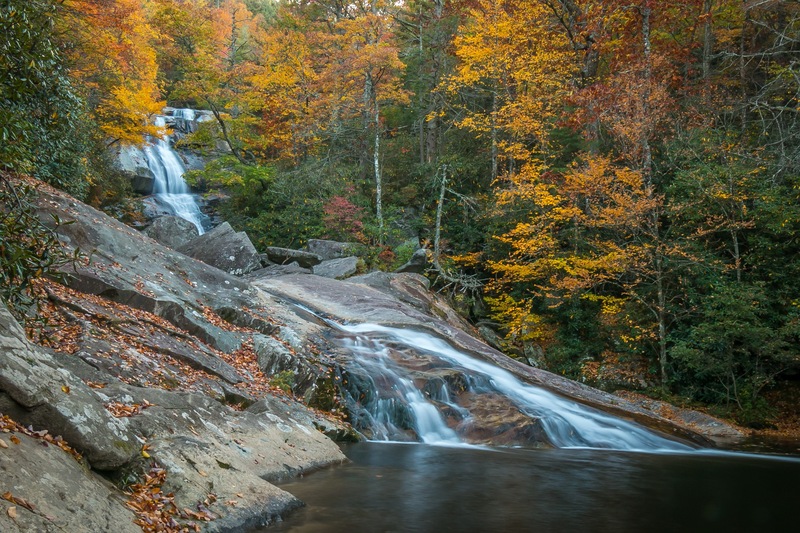 Once in the parking lot , Upper Creek Falls is a 2 mile or so moderate to strenuous loop trail. 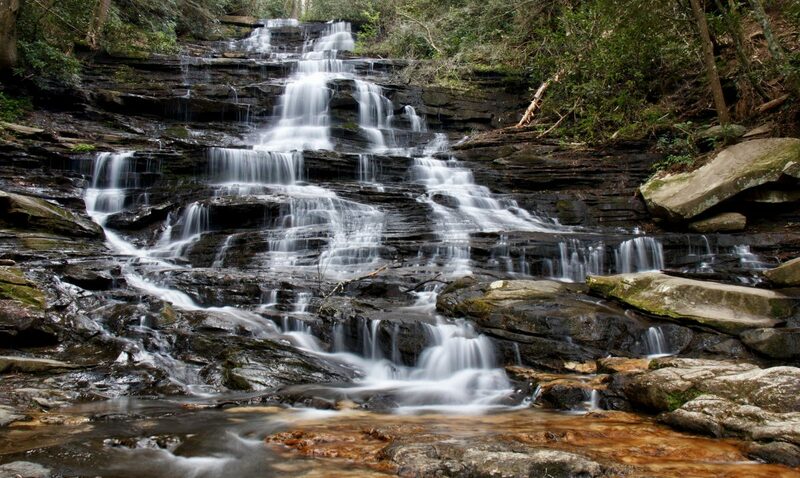 Going up the trail first, brings you to the top of Upper Creek Falls. Going down first leads you to a separate Lower Falls. I had previously taken the up route on my last 2 visits here so I went the other way this time….down, and more down. Upper Creek is a long way down the mountain this way, made easier by many switchbacks. A number of cut through trails have been formed by those not patient enough to take the proper way down. 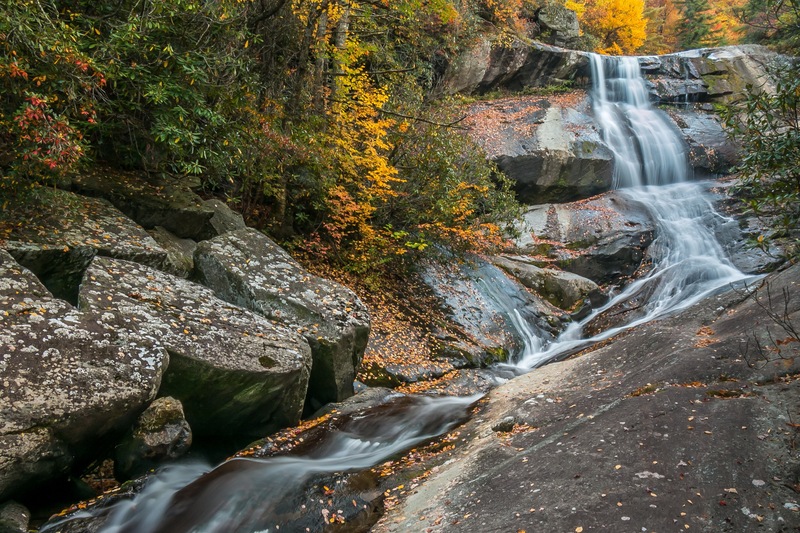 Eventually you will see Upper Creek and a scenic Lower Falls. After Lower Falls, the trail begins to climb on the opposite side of the creek. Before it gets too bad, you come to a large pool with a small waterfall. The main Falls are visible here making for an incredible scene. 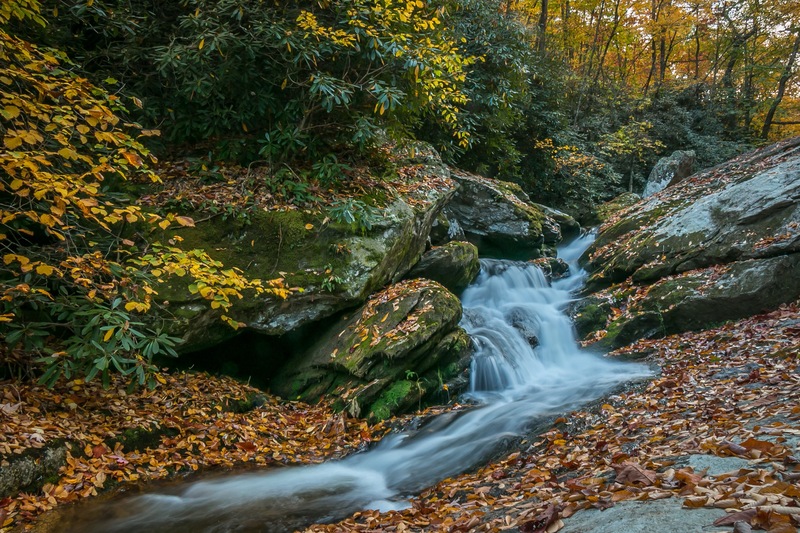 This is my favorite spot to view Upper Creek Falls. I had never seen Upper Creek Falls like this and was quite taken by it. I spent quite a bit of time rock hopping around the base trying different compositions. Afterwards I continued to work up towards the main Falls. It was also quite scenic. More climbing comes next until you finally reach the top. After a fairly easy crossing, I walked downstream on a large section of open bedrock. I got close enough to the top of the waterfall and found the colors below amazing. Wow, what an autumn color jackpot I had found on this day. I climbed the stairs on the opposite side of the creek, and now worked my way to the top to the ridge and back to my car. This hike was definitely my finest autumn color hike of 2016!